NOTE: Knife is not included. 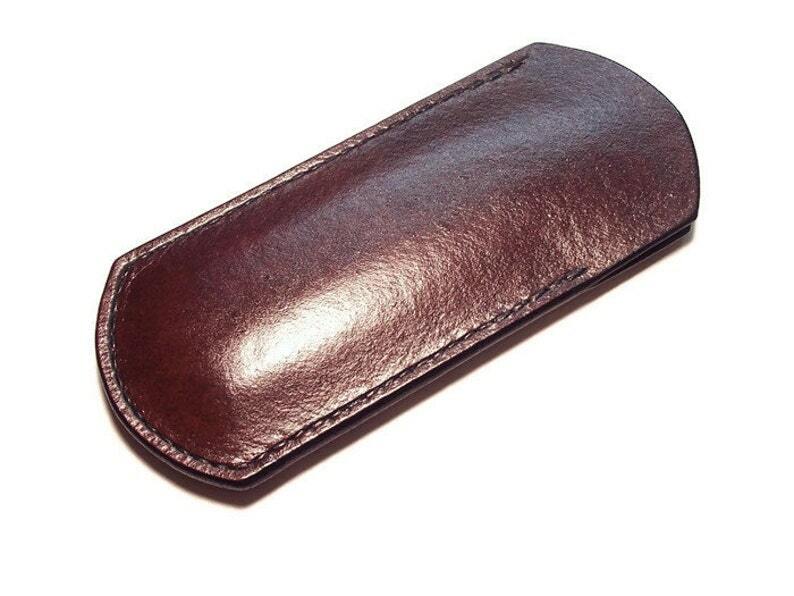 This is a custom leather Cirkle B flat sheath/pouch especially designed for the Buck 110 knife. Great for pocket or purse carry. Fits any knife or tool that measures up to 4 1/4" to 5" L X 1 1/4" W X 5/8" Thick. Features premium carving leather without tooling, recessed hand stitching with lower stitching on one side for easy removal, and hand rubbed finished edges. Can be purchased with or without a belt loop. Option for fully stitched on both sides and/or custom fit to be lower than knife at top with request at time of purchase. Available in Chocolate Brown, Saddle Tan, Black , Mahogany, Natural leather w/natural edging or Natural leather w/black edging. A color chart can be found by scrolling through the photo's. Stitching is guaranteed for the life of the item. This item is made as ordered and ships in 10-14 business days. Made in the USA and built to last !